Free Shipping Included! 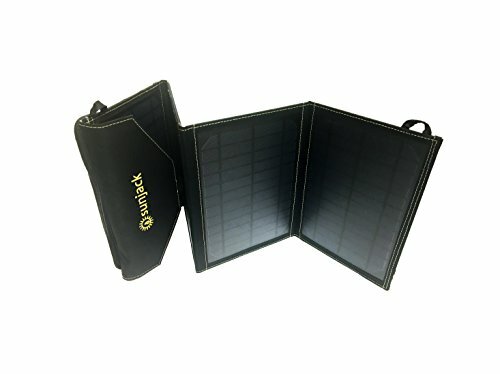 SunJack 14W Portable Solar Charger by SunJack at All Company Mobiles. MPN: SJ14WP. Hurry! Limited time offer. Offer valid only while supplies last. Stay charged anywhere the sun shines. Portable, powerful, and rugged, SunJack is valued by campers, boaters, hunters, and travelers worldwide. Stay charged anywhere the sun shines. Portable, powerful, and rugged, SunJack is valued by campers, boaters, hunters, and travelers worldwide. SunJack is also a critical item in any emergency or disaster preparedness kit. Are you prepared if the grid goes down? POWERFUL & SMART: Solar panels pump out up to 2.8 Amps of USB power, with a built-in smart IC chip to intelligently identify your device and maximize charging speed while protecting from overcharging. Automatic restore if shade occurs. RUGGED & PORTABLE: Weather resistant folding panels compact down to the size of an iPad and easily fit into any backpack. Shock-proof, dust-proof, drop-proof, tested and used by the US Military. MULTI-USE: Ideal for camping, backpacking, hiking, outdoor adventures and an essential in any emergency preparedness kit for survival. Never be caught without power. HASSLE FREE WARRANTY: Designed in California, backed by 12-month hassle free warranty from a local USA company.